Once a show has been edited and locked, I am handed a Bin with the offline sequence to reconform for online. 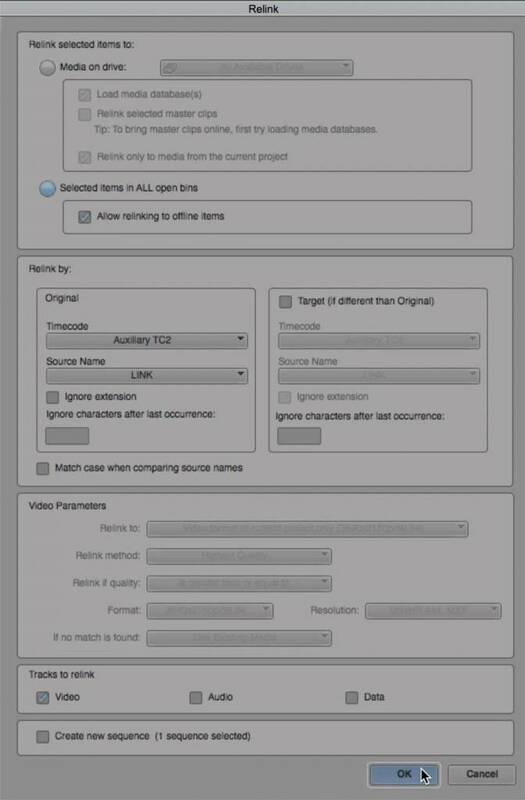 In my online reconform/digitizing/ACSR Media Composer world, every frame has to make the online edit; from relinking the pulled selects of source tapes using the Key Number Start, over timecode values that graphic artist assigned, to B-Roll and stock footage edited with different timecode values. A normal 42 minutes Scripted Show has around 600 to 700 edits, a 42 minutes Reality Show with 800 to 1200 edits (Average edit 2 seconds 2 frames). If I was digitizing tape for the online reconform, I could have a tape cart filled front and back with tapes. If it was a two hour special I could have 2 tape carts filled front and back with tapes to digitize. For Tape, I could digitize an average of 100 clips per hour. Plus, there is time lapse footage. And depending on the tape deck I might have to fix 2 to 6 frame offsets per edit event. Before Media Composer v6.5, it could take me 40 hours of metadata management alone just to prepare for the tapeless online reconform. Now some of my shows are 99 percent tapeless. Since Media Composer v6.5, within seconds I can do the metadata management for the tapeless online reconform. I have spent many hours testing and retesting columns of metadata for relinking, and I figured out an almost unbreakable Media Composer tapeless reconform. This method has been used on shows, watched by millions weekly. 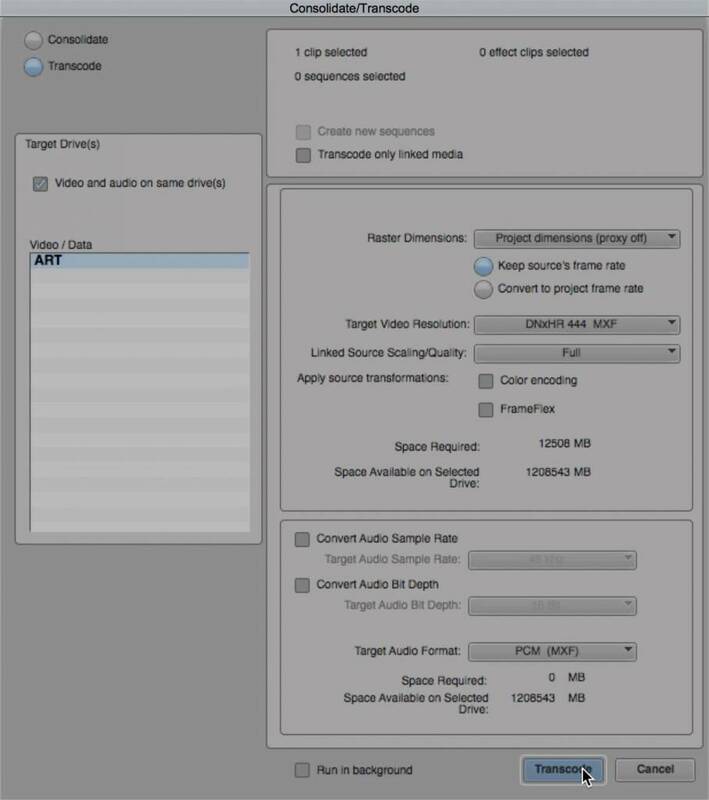 Here’s how this Avid tapeless workflow works in Media Composer v8.4. Feel free to try it on your own projects. Go to the “File Menu” and choose the “Link To Media…” command. Select a source file on the storage device. A master clip is created in the Avid Bin. In the Avid Bin, click on the column heading titled “Name”. 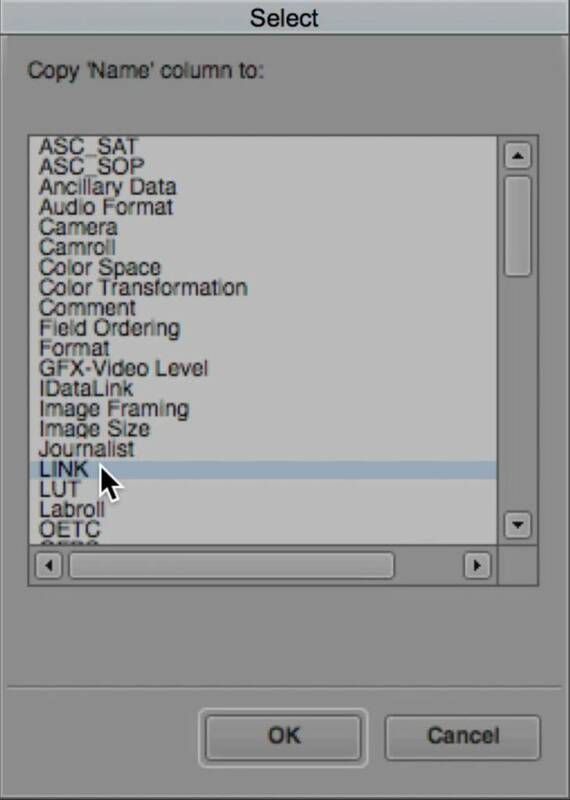 The metadata in the “Name” column becomes selected for the master clip. While the “Name” column is selected, go to the “Edit Menu” and choose the “Duplicate” command. The “Select” window appears. In the “Select” window, from the displayed list, click on the “LINK” heading to select it. Click the “OK” button at the bottom of the “Select” window. In the Avid Bin, click on the column heading titled “Start”. The metadata in the “Start” column becomes selected for the master clip. 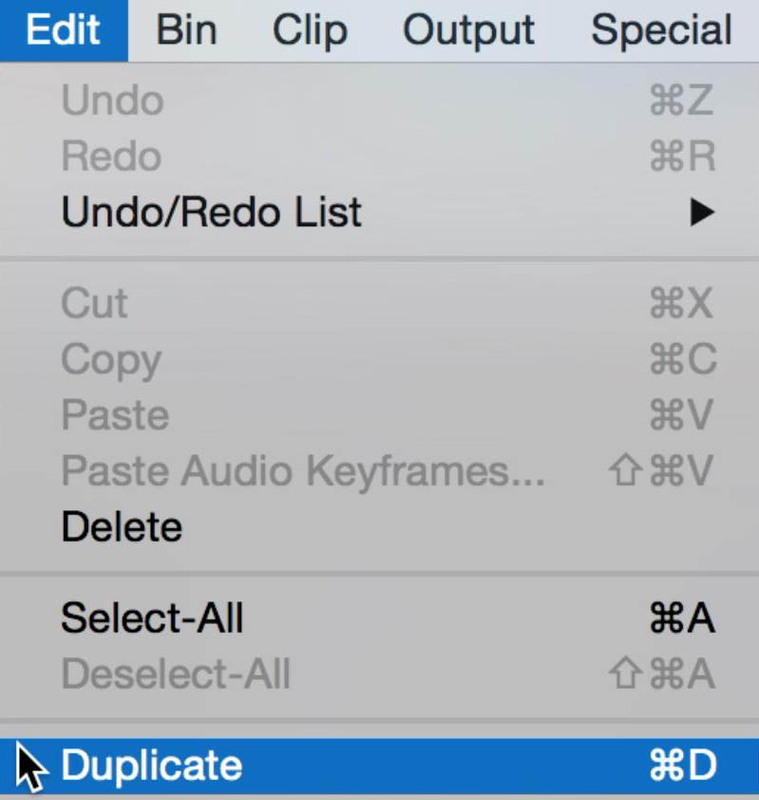 While the “Start” column is selected, go to the “Edit Menu” and choose the “Duplicate” command. The “Select” window appears. 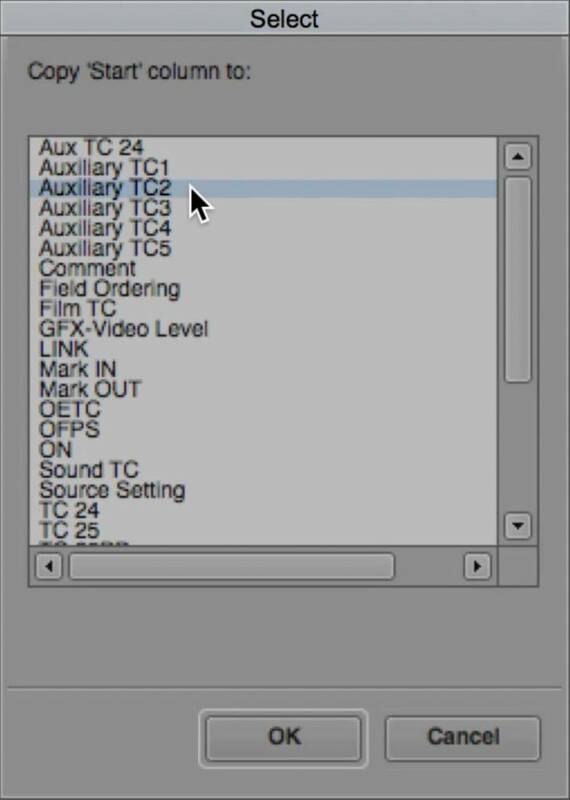 In the “Select” window, from the displayed list, click on the “Auxiliary TC2” heading to select it. Click the “OK” button at the bottom of the “Select” window. Select the Master Clip icon in the Avid Bin. While the Master Clip icon is selected, go to the “Clip Menu” and choose “Consolidate/Transcode…”. The “Consolidate/Transcode” window appears. 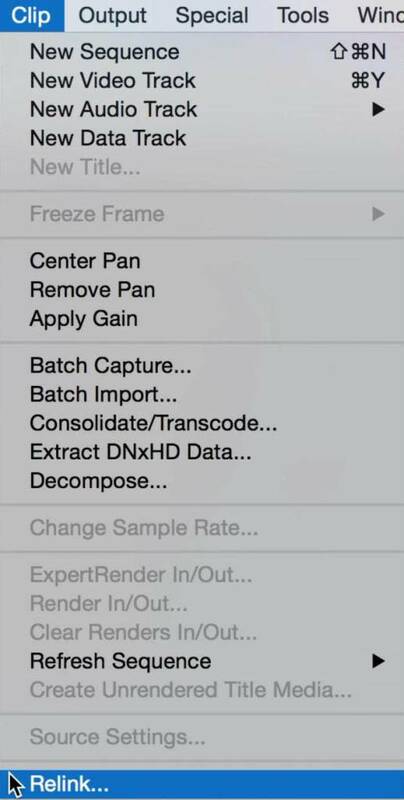 Make the desired selections for the transcode and be sure to select “Keep source’s frame rate”. 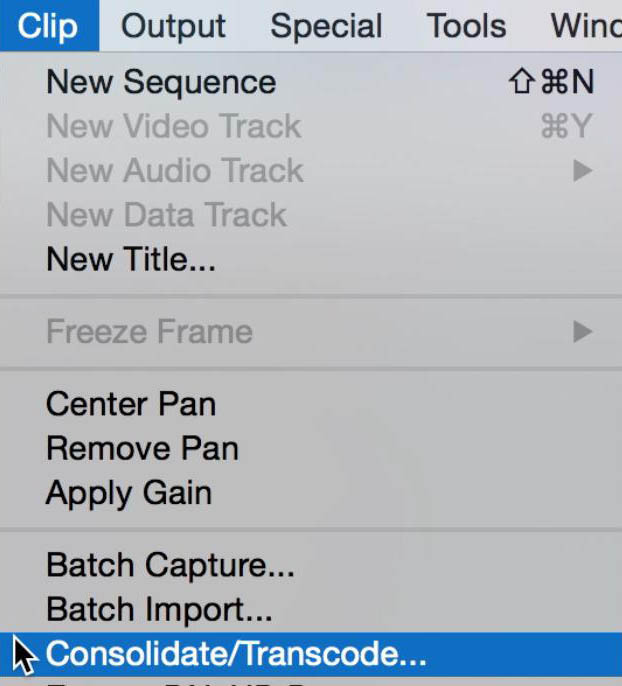 Click the “Transcode ” button at the bottom of the “Consolidate/Transcode” window. Now the transcoded master clip is ready to be cut into a sequence. Cut the transcoded master clip into a sequence. In the Avid Bin, Duplicate the original sequence and place it into the bin with the AMA Plug-in “Link to Media…” master clip. In the Project Window click the “Info” tab and then click the “Clear Bin Memory”. 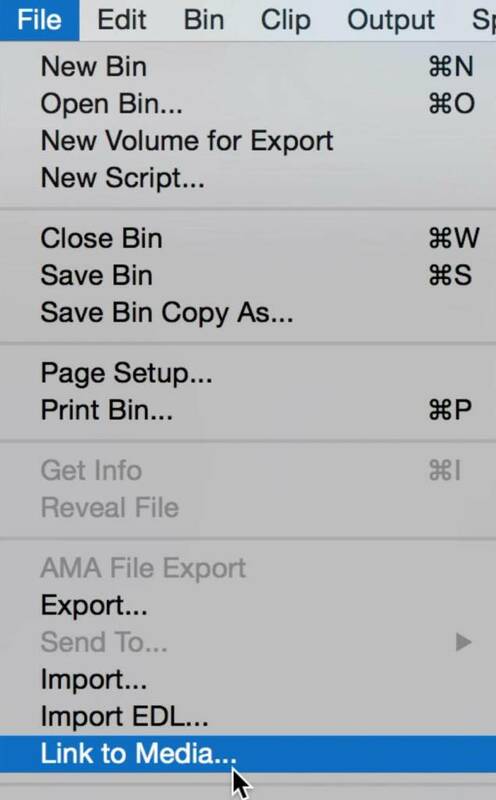 Open up the Avid Bin and select the Sequence and the AMA Plug-in “Link to Media…” Master Clip. Go to the “Clip Menu” and choose the “Relink…” command. The “Relink” window appears. Make sure to select the following settings (see picture) and click on the “OK” button. You should now have a linked Online Sequence that is now pointing to the original AMA Plug-In “Link to Media” master clip. 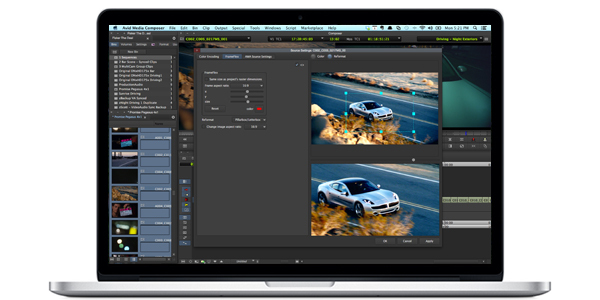 This workflow supplies both relinking to tapeless footage, and having metadata track back to the original source file at any time. If your typical offline-to-online scenario is to edit in a multicam standard definition resolution and then relink to the original tapeless camera masters for online at the desired resolution, then this workflow supports it all! It’s a true resolution independence reconform in Avid Media Composer; there’s no need to overcut or eye match, automatic reconforms are now a reality of tapeless footage. Spend less time on media management, and free up more time for the artist to create the art. I hope this is helpful!